After surviving the fall of Britpop and his departure from Blur, Graham Coxon still stays strong with a solo career. He has been called by ex-Oasis guitarist and Battle of the Britpop rival, Noel Gallagher as "the greatest guitarist of his generation". 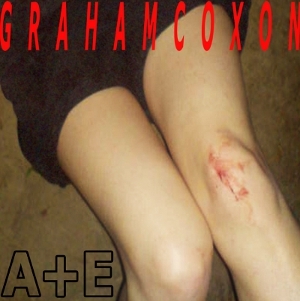 Coxon now releases his eighth album, titled A+E. Coxon first released his solo album back in 1998, while still with his chart-topping band, Blur. Since his debut solo album, a lot of changes has been made as Coxon explores with different styles and sounds throughout his discography. I remember when I first heard of his debut (The Sky Is Too High), I felt a bit disappointed compared to his work with Blur. It wasn't a pop album as compared to what Blur used to make and his works were really different and unexpected. He is then known to use his solo works to produce less popular music. First listen to A+E might make you think that it sounds like any other typical Indie album. Judging too quickly won't get you an accurate view on this new release. "City Hall" has an identical drum intro to the Foo Fighter's "All My Life". Coincidence, aye? Just as soon as the next instrument comes in, you don't hear the similarities any more. The first single, "What'll It Take" is a minimalist Indie-Electro track with repeated lyrics. The track is catchy but doesn't specifically have a deep impact. With that being said, I think the intention of the song is just to make you dance with lyrics being sung "What'll take to make you people dance". To be honest, Coxon's not very into writing really complicated lyrics in this album. "Meet And Drink And Pollinate" is also a pretty fun and dancey track to listen to. The song started out slow but halfway through it'll make you clap along to it. After the previous two tracks, "The Truth" is slightly slower paced but it won't bore you. The track was first released as a free downloadable song before the album was released. "Running For Your Life" is a piss and moan hate song, indicating some dislike in its lyrics with more fast crunch distorting guitars. A more experimental track, "Knife In The Cast" is by far the darkest song written its haunting distorted guitars with the echoing of his vocals sent shivers down your spine. "Ooh, Yeh Yeh" is the second track to release a video and it reminds me of Mark Lanegan somehow. Drumming style is very interesting in this and it's the most different style of music compared to the other tracks in the album. Some might call it old school or even sounds like The Beatles. Overall, A+E makes a stance in the Indie world and a worthy album leaving you wanting more from this Brit icon. He is also notable for playing all instruments in his solo work. If this is your first encounter with Graham Coxon, you'd probably want to check out the rest of his work, but beware, he is not your average indie musician and he will make every album different from the other. So, listen with an open mind. Recently released in April, Graham has been touring across the UK to promote his album and also preparing for the Olympics performance in August with what is possibly Blur's last gig of this reunion.